Many expecting mothers may worry about what to eat, what exercises to be done and what shouldn’t be done during pregnancy. THIRUVANANTHAPURAM: Many expecting mothers may worry about what to eat, what exercises to be done and what shouldn’t be done during pregnancy. To dissuade these mothers from fearing those months and help them to lead a healthy pregnancy, three women entrepreneurs Anjali Raj, Ganga Raj, and Suma Ajith founded an app ‘I love 9 months’ dedicated to antenatal and postpartum wellness. 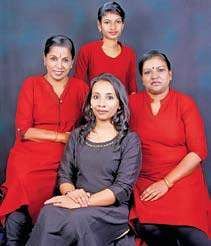 To ensure that the pregnant woman has a risk-free pregnancy, they have launched their first skilled maternity wellness birth companions ‘Sahodaris’ in Thiruvananthapuram. “We often see pregnant mothers are always worried about what exercises and things they can do for a healthy pregnancy. As a solution to all their queries, we thought of introducing these birth companions who will assist them throughout their pregnancy,” said Anjali. They have launched four Sahodaris in Thiruvananthapuram who will cater to the needs of the pregnant woman throughout their pregnancy and also after delivery. “The reason for the concept of Sahodaris is the rising number of nuclear families and the lack of support for expecting mothers in metros. This is where the Sahodaris will play their roles. If someone wants them to stay with them for the entire pregnancy period ( for example 72 hours), they will stay with them,” added Anjali. The Sahodaris are trained in different fields such as yoga and other challenges of motherhood. They will emotionally support the mother by spending quality time with them once a week. They will be trained to aid the mother through the basic fitness exercise programme. For example, if the mother feels like going for an outdoor walk but is just looking for a company, the Sahodaris are there for that too. They will also conduct research proven activities like walks, massages, climbing stairs, relaxation, and breathing techniques and comfort postures and positions to comfort the mother and help progress labour. Varsha K R is the Head of Operations in Kerala. Interested women can avail birth companions during the pre-natal and post-natal periods. They also plan to launch their endeavour in Kochi, Thrissur, Malappuram, and Kozhikode as well.